It’s no secret that Facebook has issues with… let’s say “foreign influence.” In the 2016 United States presidential election, an increasing amount of evidence has come forward showing that many sources of information, particularly information of a political nature, came from less than trustworthy sources. “Fake news” is an epidemic, and the lack of restrictions – and the lack of critical thinking and fact checking by readers – has meant that the platform needs to adapt before the government takes action. It’s not just the USA that is affected, either. There’s some evidence to suggest other destabilizing political issues, most notably Brexit, were also influenced in this way. Remember, Facebook has nearly a quarter of the world’s population on it, it has a far-reaching global influence. 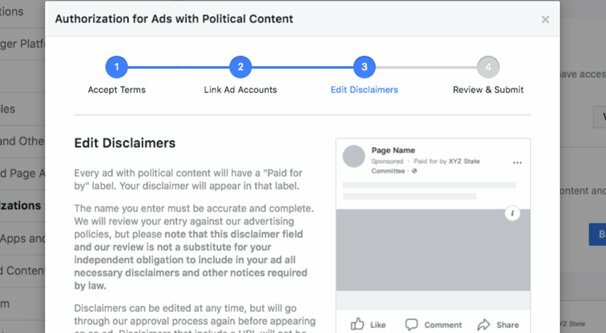 One change Facebook has implemented is restrictions on paid advertising “related to politics or issues of national importance.” In order to run ads of that nature, you need prior authorization from Facebook directly. Ads that are made by or on behalf of a current, former, or prospective candidate for public office, a political party, a PAC or SuperPAC, or anyone with a vested interest in the outcome of an election. Ads that relate to any election, referendum, ballot initiative, or other campaign or campaign strategy or organization. Ads that relate to any national legislative issue relevant to the location where the ad is being run. Ads that are considered political advertising in other systems. Facebook maintains a list of topics that can be considered of national importance. Crime, civil rights, energy, foreign policy, guns, health topics, immigration, poverty, taxes, and even “values” are all on the list. If you’re looking at the list and thinking “that’s a huge number of very broad keywords,” you’d be very right. Facebook is deliberately making their definitions as broad as possible, to give themselves the appropriate framework necessary for rationalization when they reject or remove ads in the future, or deny authorization. Now, one thing to note here is that Facebook does not take a stance on any of these issues. They simply say “guns”, not “pro-gun ads” or “gun control ads” or anything of the sort. You can bet they’ll approve organizations like the NRA, and they’ll also approve organizations like the Gun Violence Archive, as both are legitimate domestic organizations. So basically you can fall into one of three categories. In a country that does not require authorization for political ads, in which case you can disregard this article entirely. In a country that requires authorization but does not have a listed set of topics, in which case you should apply for authorization and do your own due diligence. In the United States, in which case you should strongly consider applying for authorization. Even if you don’t think you’re ever planning to run political ads, it might still be worth looking into. It’s one thing to run political ads explicitly supporting one political party or another, or supporting your favorite candidate for Senate, or whatever else might be relevant to your region for your business. If you’re a political action committee, you’d probably want to run those ads, right? What about brands that don’t have a vested interest in politics, or who don’t want to spend their own money to support a candidate via ads when a donation can be much more effective? Here’s the thing: a lot of issues that might be relevant to your business are issues that might end up on the list. Let’s say you write a blog post about how you pay your employees a living wage and how you support fair wages for all. Seems fine, right? That can fall under Poverty and thus be considered an ad about an issue of national importance. Let’s say you write a blog post about how your company is focusing on recycling and minimizing your reliance on fossil fuels in shipping. That can fall under Energy, or Environment, or even Infrastructure, depending on how you look at it. Let’s say you’re a business offering a military discount. Even advertising that can fall under the Military category, and thus be considered enough of a contentious issue that Facebook may take issue. On top of all of this, if you’re an ad manager and have a variety of clients, you never know when one of your clients may want to run an ad that would get flagged. Getting authorization helps you avoid many sticky situations. The long and the short of it is simple. A lot of issues are important on a national level and can be considered political, even if your side considers it an open-and-shut moral case. It’s better to get authorized than it is to run into a roadblock at a critical moment. So what does authorization do? Any time you make an ad on Facebook, you have to submit it for review, and it can be rejected for a number of different reasons. Now, those ads may be rejected as political or national importance ads. Unlike other ads, if this happens, you will simply be unable to run similar ads until you obtain authorization. There’s no “change the title and try again” here. 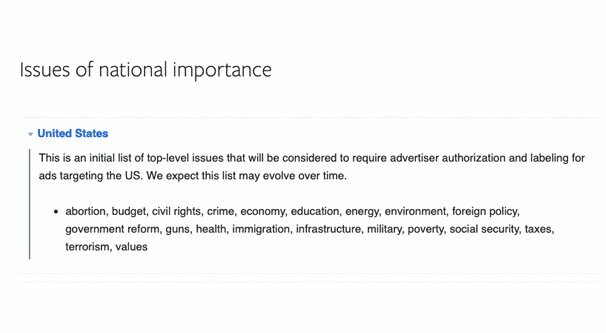 Any ads that are considered political ads will have an additional disclaimer. In addition to the post being labeled sponsored, it will also have a “paid for by <your organization>” disclaimer. This way everyone knows who is paying for the ad, to know if it might be disingenuous or otherwise propaganda. Political ads are also slightly restricted in positioning. You cannot run political ads on WhatsApp, Messenger, or Audience Network placements at all. You also cannot run them via boosted live video or dynamic ads on Facebook and Instagram. 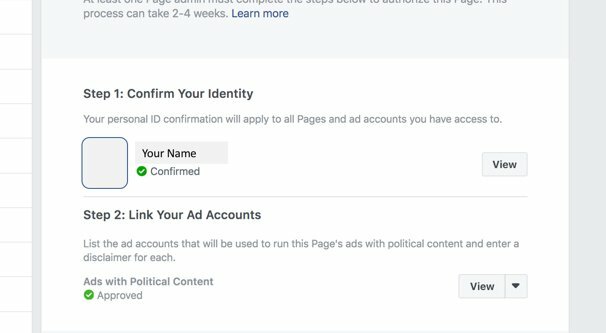 On top of all of this, any political ads you run will be stored in the Facebook political ads archive for seven years. This means anyone can check into your ad history. For some businesses that like segmenting their audience by political lines and playing both sides, this will show off the hypocrisy very nicely. First of all, you need to know whether or not you’re in a country that has an authorization program or not. The United States is the big one, of course, but as of this writing, six other countries have authorization programs as well. These are the United Kingdom, the Ukraine, Thailand, Indonesia, India, and Brazil. Now, the authorization process is long enough that I’m not going to reproduce the instructions for each individual country, so go to this page if you’re in one such country to view the specific instructions. I’ll go ahead and cover the USA version. Next, you need to gather up the information necessary to confirm your identity. You need to be the Page Admin of the Page running the ads. Anyone who is creating, modifying, or publishing ads will also need to have their identity confirmed, so make sure anyone with a relevant page role also goes through this process. You have to enable two-factor authentication on Facebook. This is a security measure to help minimize the chances of compromised pages being used for political action. It also allows Facebook to restrict access to some regions, since two-factor authentication might not work in some regions. It’s easy enough to set up, though, and I recommend that every business owner sets it up regardless. Frankly, enhanced security should always be applied whenever possible. Additionally, you need documentation that proves your identity. This can include a driver’s license, a state ID card, or a Passport. You will also need a residential mailing address in the USA. If you’re the admin of a US-based page but you live in South Africa or something, you’re out of luck. This also means that, if you outsource the ad management for your page to a freelancer in a different country, they will need to go through the authorization process as well. Once you have your information gathered, go through the authorization process. Go to your Page and click Settings. In the list that appears, click Authorizations, then find the Where Do You Live section and click the one for your country, in this case the USA. Click Get Started a couple of times, then confirm your primary residence by adding your mailing address. Facebook will mail you a letter with a code on it, which you must input to verify. Next, choose the type of ID you have and upload a scan. This file must be a JPG or PNG and has to be at minimum 1,500×1,000 pixels in size. In other words, it needs to be large enough Facebook can read the relevant details. The address on your ID doesn’t need to match your mailing address, but you may run into issues if it’s not a valid address. You will then be asked a series of questions that will verify your identity. You can try repeatedly until you answer correctly, but you must have a certain number of answers correct to proceed. All of this information will be reviewed by “trusted partners,” in other words, Facebook is outsourcing it all to a company that does ID verification as their primary service, rather than trying to get their moderators to do it. 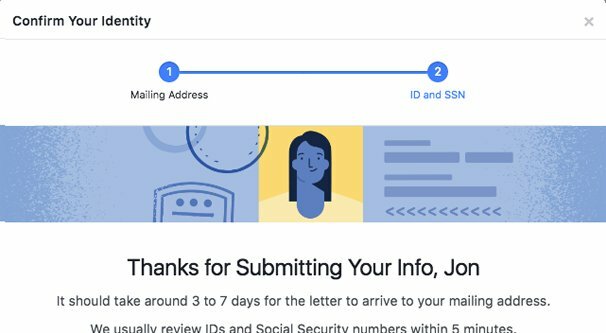 Within a week, your letter should arrive from Facebook, at which point you input the code to finish the authorization process. 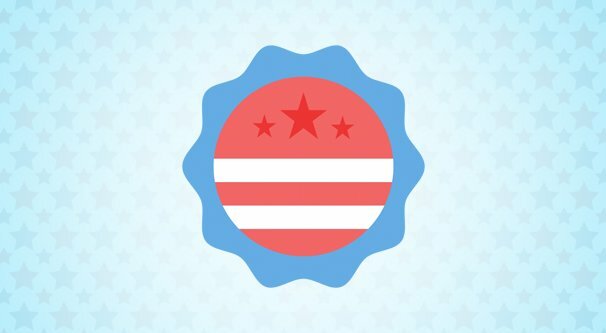 You will also need to authorize your Instagram account if you plan to run political ads on IG. At this point, you will be able to create ads as normal. 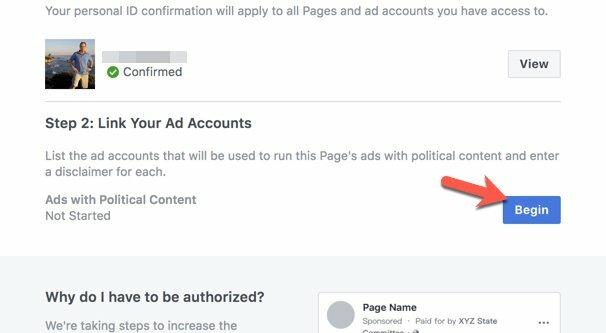 However, if you want to run political ads, your ad account currency must be in USD, at least one payment method must be tied to a US-based funding address or none at all, and your personal self-declared location as the person creating the ad must be in the USA. If your ad manager is ironically saying they live in Russia as a joke, that can get your ads rejected, so watch out. Once all of this is finally complete, you can run ads on political position or on any issue of national importance without issues.